Aqua/water/eau. Peg-6 Caprylic/capric Glycerides, Sodium Citrate, Zinc Gluconate, Copper Sulfate, Gingko Biloba Leaf Extract, Manitol, Xylitol, Rhamnose, Fructooligosaccharides, Propylene Glycol, Citric Acid, Disodium Edta, Cetrimonium Bromide, Fragrance (Parfum). The French cult-classic cleansing water, now with a purifying formula designed for oily, acne-prone, and combination skin. 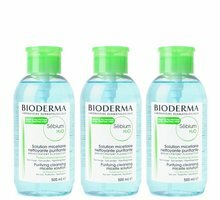 Bioderma Sébium H2O is a no-rinse micellar water and makeup remover that gently cleanses makeup, dirt, and debris from the skin while regulating sebum production for a fresh, matte finish without drying or stripping. 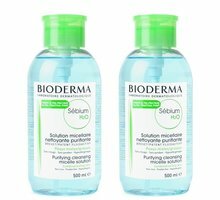 Have a question about Bioderma Sébium H2O? I have both bio deems micelar waters. But I love this one way more. This one melts my makeup off! I used to have to tug a little with the other one. Works very effectively to remove makeup prior to cleansing and also as a post-cleansing toner. It does not leave any residue, just clean soft skin that's ready for whatever you use next. I also received a sample of the pore refiner/primer and I'll DEFINITELY get the full size in my next order. Kudos to Beautylish for the great products! I have very sensitive eyes. Bioderma worked very well and didn't make my eyes sting like most removers do. I just got this and I'm in love. I used it for half of my face and cleaned the other half with a makeup wipe. Let's just say it puts the makeup wipe to shame. My new go to. Took all my oil off and left me feeling fresh and clean. Absolutely love the smell. I have developed roseacea and adult acne and have struggled to find a cleanser that is gentle yet effective. This pore refiner does the trick! Thankfully a little goes a long way! I use this after I have cleansed with a mild soap, almost like a toner. I Love it! After everyone raving about over YouTube I went and have it a shot and let me just say ... I'm in love with this product it removes everything and afterwards it has your face feeling fresh and clean. I've purchased it twice in 3 weeks. BYW: the pump is soo convenient!! I love the sample I received so I bought the full size. I have oily skin and i felt it took my makeup well. I use the pink bottle bioderma for my eyes. The pink one takes my mascara off perfectly. This one is great to take my makeup for my face. I would repurchase this. The pump makes it so convenient!! 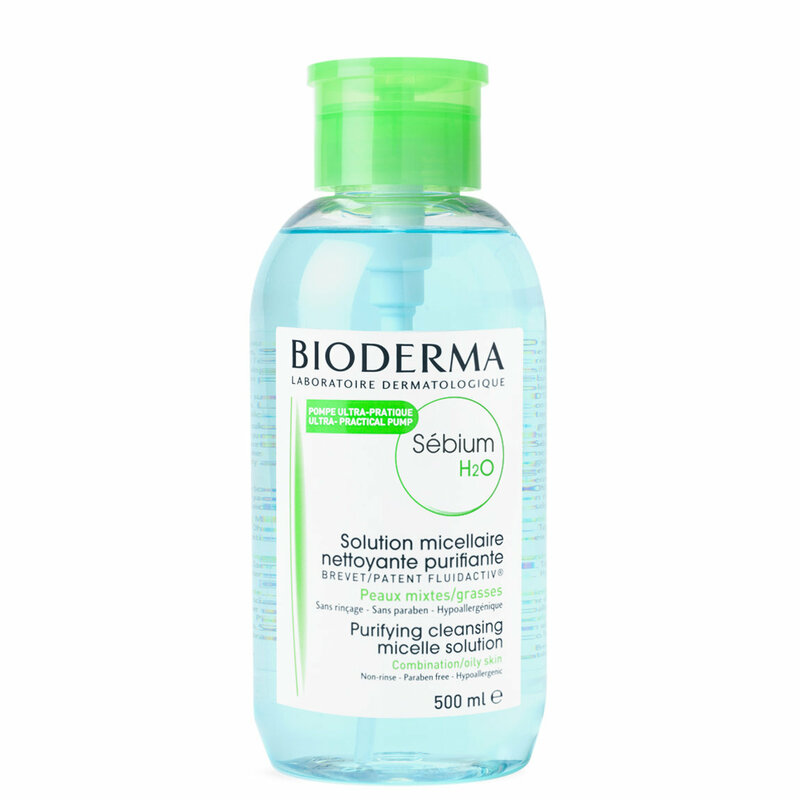 My favorite Micellar Water in a PUMP! This is hands down my favorite makeup removing/skin cleansing product. I found out about it from KathleenLights on YouTube and I ordered it after hearing her constantly rave about it's magical powers. The fact that It was released in a pump made me order a new bottle long before I was done with my other one! This product doesn't dry or sting your skin, but it removes all dirt and oil like a magnet. Put it on a cotton pad and you've got a Swiffer Duster for your face. Love it. It's the best. Period. i was really hesitant on buying this as a makeup remover because i use waterproof mascara which is really tough to get off but i have to say this does remove more than i expected. This removes everything else off 100% and leaves my skin so soft!!! the majority of the time i dont even wash my face after removing all my makeup, something i had to do after removing it with water/oil base makeup remover. Im obsessed with this!!! !